Outside of legal circles, the name Fernando Cruz likely didn’t ring a bell to most Costa Ricans until late last week. But the 63-year-old Supreme Court justice has found himself at the center of one of Costa Rica’s biggest political crises in recent memory. On Nov. 15, 38 lawmakers from various political parties voted to deny Cruz’s re-election to the Constitutional Chamber of the Supreme Court, or Sala IV, where he had served independently since 2004. According to the Costa Rican Constitution, Sala IV justices are elected to eight-year terms, and then automatically re-elected unless lawmakers vote by a two-thirds majority to remove them when their terms expire. This is what happened to Cruz, who became the first Sala IV justice to be blocked from serving a second term. The political backlash that resulted is showing serious cracks in the country’s democratic system, with members of the judicial branch rallying to defend Cruz and accusing members of the legislative and executive branches of upsetting the country’s democratic balance of power. Public defenders Yamura Valenciano and Maritza Aguilar join a vigil Wednesday night organized by the Supreme Court against a Legislative Assembly attempt to block Justice Fernando Cruz’s re-election. “The Legislative Assembly has taken a swipe at the Supreme Court,” said former Costa Rican President Luis Alberto Monge, who was outraged at the lawmakers’ vote. Monge, who served from 1982-1986, is one of Costa Rica’s heaviest political hitters, helping found the ruling National Liberation Party (PLN), which unanimously voted against Cruz. Monge also is the only living signatory of Costa Rica’s Constitution of 1949. So why was Cruz removed? Lawmakers who voted in favor of blocking the justice’s re-election belong to several political parties, including Liberation, the Social Christian Unity Party (PUSC), the Libertarian Movement Party and Costa Rica’s two evangelical political parties. They deny a political conspiracy to remove the justice – which some supporters of Cruz allege was organized by President Laura Chinchilla’s administration, a charge the administration denies – each offering their own reasons for the vote, and some of them citing the public will for change at the Sala IV, which wields enormous judicial power over the country’s laws. PLN lawmaker Siany Villalobos, who voted to block Cruz’s re-election, said she hoped to improve the Sala IV. She cited a recent poll concluding that seven of 10 Costa Ricans are unsatisfied with the court’s performance. According to Villalobos, the decision to “send a message” to the Sala IV coincided with the end of Cruz’s eight-year term. On the other side of the issue, Cruz’s supporters say lawmakers had plenty to gain from removing a thorn in their side. Supreme Court President Luis Paulino Mora delivers a fiery speech in front of black mourning banner on Court. Cruz received a law degree from the University of Costa Rica, and a doctorate in law from the Universidad Complutense in Madrid, Spain. He began his extensive judicial career in 1972 as a minor crimes investigator, working his way up the ladder to chief public prosecutor, and ultimately, Sala IV justice, in 2004. According to José Manuel Arroyo, president of the Penal Branch of the Supreme Court, Cruz could rule on politically sensitive cases such as one involving a mining concession granted to Industrias Infinitos to develop the Crucitas gold mine in Cutris de San Carlos, in northern Costa Rica. 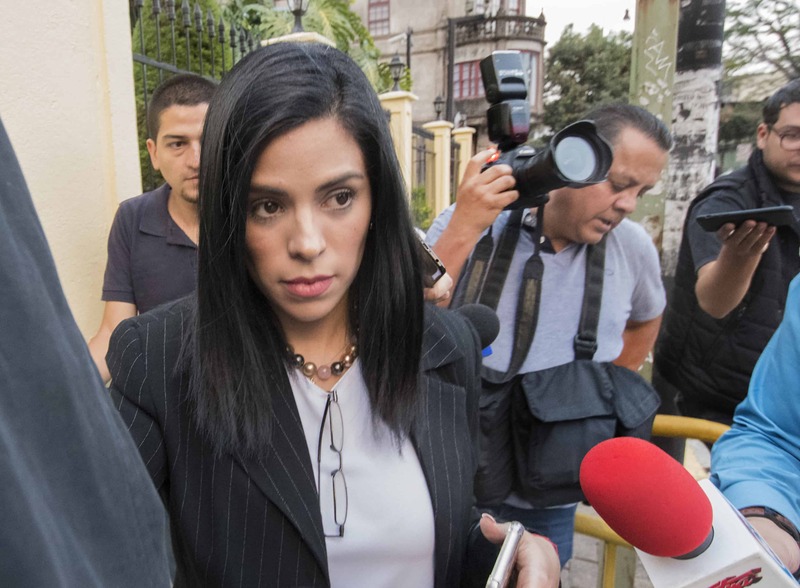 Another case involves PLN presidential candidate Rodrigo Arias – brother of former two-term President Oscar Arias – and the management of funds from the Central American Bank of Economic Integration. Rodrigo Arias was cleared of any criminal wrongdoing in the case, but the Sala IV likely will rule on appeals in the case. Then there’s Cruz’s past record. According to the daily La Nación, the justice held a dissenting position in the highly divisive case of the U.S.-Central America Free Trade Agreement, which narrowly passed a public referendum in 2007. Cruz also ruled against the constitutionality of a fiscal reform plan, the failed centerpiece of the Chinchilla administration. He ruled against a lawsuit requesting an injunction by ex-President Rafael Ángel Calderón Fournier (1990-1994), who sought to be conditionally released from jail during a corruption trial. “If what [lawmakers] want to do is fix what is wrong with the Sala IV, the democratic method for those who have the power to do so is to reform the constitution or the law that governs [the Sala IV], not make a scapegoat out of someone who has angered political sectors with his decisions,” Arroyo said. The political row over justice Cruz was so significant that Luis Fishman, who until this week served as legislative head of PUSC, quit his party in the Legislative Assembly (although he remains a member of the party outside the assembly). Fishman battled with fellow PUSC lawmakers who voted to prevent Cruz’s re-election. Not only did Fishman renounce his party in the assembly, he also fought to reinstate Cruz to a second term, filing a constitutional challenge to the same court where Cruz had been removed. Fishman’s Sala IV challenge – along with 10 other appeals – noted that lawmakers’ vote last week was unconstitutional, as the term to remove Cruz had expired in October. Cruz’s eight-year term expired on Oct. 18, and the vote took place on Nov. 15. According to Fishman, Cruz should have been automatically re-elected in October. On Tuesday, assembly President Víctor Emilio Granados, of the Access Without Exclusion Party, agreed with Fishman’s analysis, annulling last week’s vote and ordering Cruz to be sworn in on Thursday. That never happened, as lawmakers fought back with an immediate 26-19 vote to override Granados’ annulment and ratify the Nov. 15 vote. The matter now goes to the same court whose members back Cruz – the Sala IV. A final ruling could take as long as 14 months, Cruz told Channel 7’s Telenoticias. Meanwhile, the court has ordered the legislative vote from last week to be suspended, pending a ruling. “Whatever the Sala IV’s ruling, … lawmakers and the country will have to accept it,” said lawmaker Fabio Molina, head of the PLN’s legislative bloc. Meanwhile, Chinchilla, who returned on Tuesday from an official visit to Spain and is already facing the lowest voter approval rating in the Americas, promised to meet with the presidents of the assembly and the Supreme Court in an attempt to ease the crisis. On Wednesday night, members of the judicial branch organized a candlelight vigil in the Plaza de la Justicia outside the court complex in downtown San José. Several prominent Costa Rican musicians performed in support of “Costa Rica’s tradition of democracy” and a separation of powers. Tico Times online editor L. Arias contributed to this story.